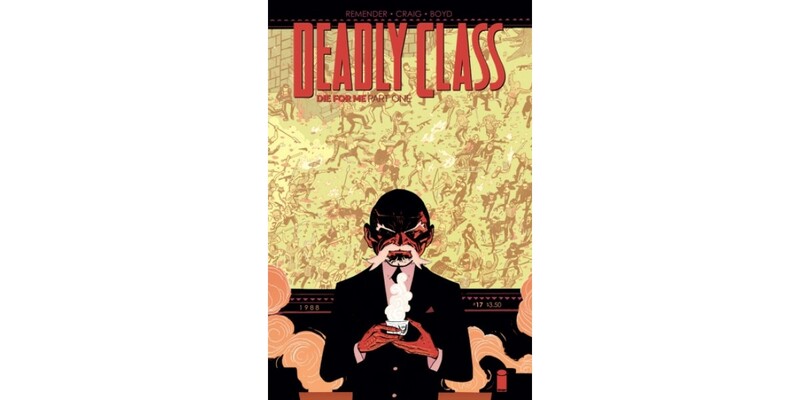 Bestselling writer Rick Remender (BLACK SCIENCE, TOKYO GHOST) and critically acclaimed artist Wes Craig (BLACK HAND COMICS) will launch a new story arc in their ongoing cult-hit drama DEADLY CLASS this December. Previously in DEADLY CLASS, homeless orphan Marcus Lopez joined a shadowy school specializing in training the next generation of the world's deadliest assassins, thinking he had nothing left to lose. He quickly discovered how wrong he was, finding himself forced to fight off a drug cartel amidst his own wanton self-destruction. In DEADLY CLASS #17, The King’s Dominion school grounds become a killing field, and Marcus Lopez is hunted by his classmates for their final exam. Onetime friends and lovers become hunters in the dark, brandishing blades, bullets, and a burning desire to become best in class. "The boiling point has been reached. We wanted to take our time before smashing the trains together for the battle royale, to earn it by building the cast and their emotional connections and drama, and this is it. It's a horrifying chapter in the student's lives, but coming out the other end of it there's a moral to all of the horror,” said Remender. “Wes and Jordan haven't looked better, but if you're a fan of good art you don't need me to tell you that. But I did anyway in case you aren't. So there." DEADLY CLASS #17 (Diamond code OCT150523) hits stores Wednesday, December 16th. Final order cutoff deadline for retailers is Monday, November 23rd.